Ht / Wt: 6'5" / 220 lb. 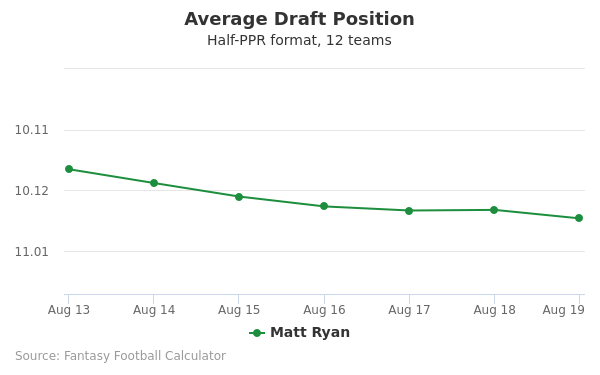 Matt Ryan's fantasy value is measured by his average draft position (ADP) in fantasy football mock drafts. 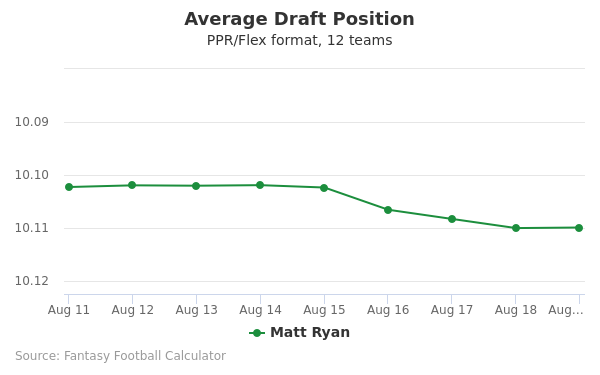 In recent drafts, Ryan's current ADP is 7.08, which indicates that his fantasy outlook is to be the 8th pick of the 7th round, and 79th selection overall. The code below will display a graph that updates every day to show the ADP data for Matt Ryan for the past 30 days in 12-team PPR leagues. Draft Matt Ryan or Vance McDonald? Draft Corey Davis or Matt Ryan? Draft Matt Ryan or Philip Rivers? Draft Carson Wentz or Matt Ryan? Draft Allen Robinson or Matt Ryan? Draft Matt Ryan or Peyton Barber? Draft Chicago Defense or Matt Ryan? Draft Latavius Murray or Matt Ryan? Draft Jared Cook or Matt Ryan? Draft Josh Jacobs or Matt Ryan? Draft Christian Kirk or Matt Ryan? Draft Jared Goff or Matt Ryan? Draft Emmanuel Sanders or Matt Ryan? Draft Matt Ryan or Royce Freeman? Draft Carlos Hyde or Matt Ryan? Draft Marvin Jones or Matt Ryan? Draft Dante Pettis or Matt Ryan? Draft Cam Newton or Matt Ryan? Draft Courtland Sutton or Matt Ryan? 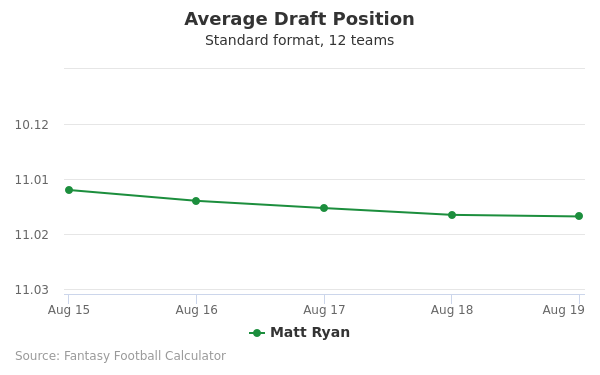 Draft DK Metcalf or Matt Ryan? Draft Austin Ekeler or Matt Ryan? Draft LA Rams Defense or Matt Ryan? Draft DeSean Jackson or Matt Ryan? Draft Matt Ryan or Sterling Shepard? Start Matt Ryan or Vance McDonald? Start Corey Davis or Matt Ryan? Start Matt Ryan or Philip Rivers? Start Carson Wentz or Matt Ryan? Start Allen Robinson or Matt Ryan? Start Matt Ryan or Peyton Barber? Start Chicago Defense or Matt Ryan? Start Latavius Murray or Matt Ryan? Start Jared Cook or Matt Ryan? Start Josh Jacobs or Matt Ryan? Start Christian Kirk or Matt Ryan? Start Jared Goff or Matt Ryan? Start Emmanuel Sanders or Matt Ryan? Start Matt Ryan or Royce Freeman? Start Carlos Hyde or Matt Ryan? Start Marvin Jones or Matt Ryan? Start Dante Pettis or Matt Ryan? Start Cam Newton or Matt Ryan? Start Courtland Sutton or Matt Ryan? 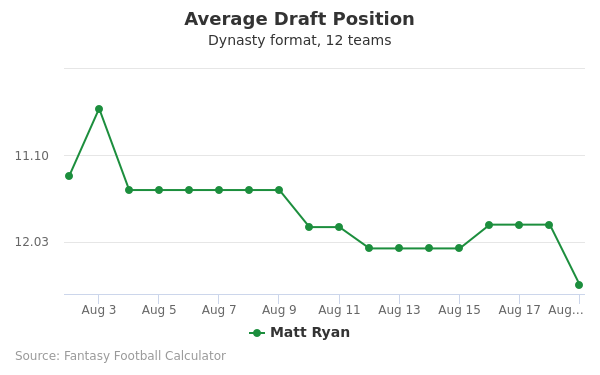 Start DK Metcalf or Matt Ryan? Start Austin Ekeler or Matt Ryan? Start LA Rams Defense or Matt Ryan? Start DeSean Jackson or Matt Ryan? Start Matt Ryan or Sterling Shepard? Matt Ryan was born May 17, 1985 in Exton, Pennsylvania. His high school football career began when he attended the William Penn Charter School in Philadelphia, Pennsylvania. What’s known as the “bible” of college football recruiting, the Larunt Lemming Prep Football Report, lists him as a three-year starter who earned All-East honors. He attended Boston College from 2005 to 2007, and as starting quarterback he helped his team achieve three bowl victories and a 25–7 record in 32 starts. He threw for 200 or more yards 15 times and is third all time in school history in passing yards (9315) and in pass completions. In 2005, he was named MVP at the MPC Computers Bowl. In 2007 the team got an Atlantic Division championship and Matt Ryan , with 31 touchdown passes, was declared ACC Player of the Year. He won the Johnny Unitas Golden Arm Award for the nation’s top senior quarterback, and also the Manning Award for the nation’s top quarterback. To this day, when Boston College is trying to recruit new players, they immediately let them know that Matt Ryan played there. His #12 Boston College jersey has been retired. See Matt Ryan’s top 5 plays at Boston College. Ryan was drafted by the Atlanta Falcons in the first round of the 2008 NFL draft, as the third overall pick. His first contract (with a total value of $72 million) made him one of the four highest paid quarterbacks in the NFL. He proved his worth. His first N.F.L. pass was a 62-yard touchdown, and when the Falcons went to the playoffs he was named Rookie of the Year in a landslide vote of broadcasters and sportswriters. During his eight seasons in the NFL, he achieved numerous franchise records (28,166 career passing yards, 3916 career pass attempts, 2508 career completions, 181 career touchdowns, 91.1, career passing rating, and 64.0 career completion percentage. He completed 2,915 of 4,530 passes, for 32,757 yards and 202 touchdowns. He has been a Diet Pepsi Rookie of the week and he went from that to being named NFC Rookie of the Month for a winning streak that gave the Falcons a 2-1 record. This was a first in history for the Falcons! Matt Ryan had numerous “firsts” during his career with the Falcons. He was the first rookie quarterback to throw for more than 300 yards in a season, and he was one of the first rookie quarterbacks to lead his team to the playoffs after starting all 16 games of the season. In the 2012 season, after four tries, Matt Ryan got his first playoff victory, over the Seahawks, but the next week the Falcons lost to the 49ers. The team reached a low point in 2015 with a 3-8 stretch, after starting 5-0. Matt threw for 16 interceptions and had 12 fumbles. For season 2016, the Falcons averaged 33.5 points per game, and led the league in turnovers in the red zone. Ryan's achievements include being recognized as the NFL Most Valuable Player by the Pro Football Writers Association. He is the first Falcons player to win this award. He was also named offensive player of the year. Finally, after helping the Falcons get to the postseason four times out of five, they won the NFC Championship Game – 44-21 over Green Bay, taking the team to Superbowl 51. See Matt Ryan’s career highlights here. Ryan is also on the verge of perhaps winning the Associated Press MVP award, because of his 38 touchdowns with seven interceptions, a 69.9 completion percentage, 4944 passing yards and a 117.QB passer rating. Most recently Matt Ryan negotiated a $103,750,000 contract, with a $28,000,000 signing bonus. $42,000,000 is guaranteed, and he has an average annual salary of $20,750,000. Ryan is not the only athlete in his family. His wife Sarah, who he met at Boston college, is a former Maine high school basketball legend. For more on Matt Ryan try instagram (@ryan_matt02) or twitter (@mattryarreal).